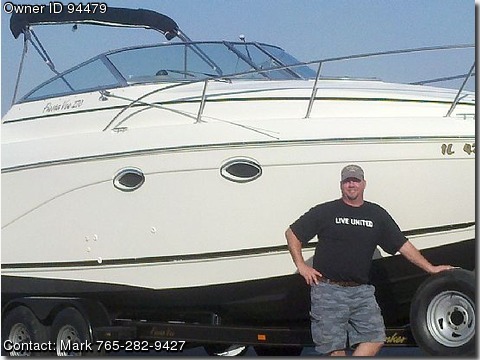 Call Boat Owner Mark 765-282-9427 765-729-9222.
with included matching Rinker package tandem axle trailer. highly sought after and very affordable sport cruiser. camper canvas for use when needed. storage under and filler cushion for sun bathing. and blue led lighted cup holders and deck lighting. foredeck for access to anchor storage compartment. filler cushions and storage underneath. each side and an overhead hatch with screen. locker, mirror and an opening port. hydraulic adjustable trim tabs, and 2 coats of bottom paint.